A washed-up, lovesick concert pianist takes a dive in his car over a cliff. Insurance and financial woes complicate the matter. Perry must clear the pianist's prot�g� of any suspicion. Anomaly: Kathie Browne is listed as Donna Loring but is called Donna Ross. [Tom Rankin]. In the office scene where Perry is dictating to Della from a book, when he says �California State Penal Code, section 1362, dealing in competency as evidence when witness uh...,� he is speaking of an actual and appropriate section of the CSPC. Submitted by Steve Fox, 10/20/2004. + Goof: Right after the above scene Perry closes the book with an audible thud, picks up the newspaper while putting the book down with his left hand and holds the newspaper with both hands. When the camera switches to a front view we hear what sounds like the thud of the book closing again and Perry has his right hand below the screen apparently putting the book down again. Submitted by Wiseguy70005, 5/13/14. 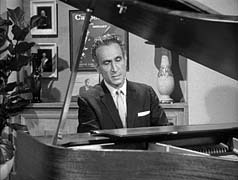 Music:The piece playing at the episode�s opening (with Carpenter at the piano) is Beethoven�s Sonata in C minor, Op. 13, No. 8, also called the Sonata Path�tique. The closed captions coupled with the syndication print incorrectly list this as the overture from Beethoven�s Fidelio. Submitted by gracep 10/21/2010. + The closed-captions on the DVD simply state "(piano music playing)" and later, "(classical piano music playing)." Submitted by Wiseguy70005, 5/13/14. + See also comments below regarding Donna�s piece. Sightings: Appearing in the courtroom gallery are Distinguished Gentleman #1 and the Little Old Lady in a Hat on the defendant�s side, along with Quiet Old Man #1 and �Miss Carmody� on the prosecutor�s side. A pencil-mustached man peers through the crowd as well (prosecutor�s side). Can you see them? Read more about these favorite frequent faces and why we are trying to spot them. Submitted by gracep, 10/21/2010. + Sitting next to DG #1 we find Distinguished Lady #4. Bill767, 1/3/16. Uncredited Actors: Robert Wegner gets two appearances in this episode. He's a frowning spectator on the prosecution side, and he seems to be a uniformed policeman at the desk outside Tragg�s office when Tragg, Mason, and Worthington meet. Submitted by FredK, 20 Nov 2010. + Don Anderson is among the second-row spectators on A.D.A. Chamberlin�s side of the court. Submitted by FredK, 20 Nov 2010. Just TWO CARS: Perry's 1960 Ford Galaxie Special Sunliner, Lic No TVC 236, black, top down. On his drive to see Donna Loring, Perry passes a parked all-white 1949 Dodge Wayfarer Sports Roadster convertible, top up (19:55-20:04). Don't fret if you missed it; the same footage is reused in Ep#107! Added by Gary Woloski, 10/1/12. +Chronological Car Anomaly: The old-car-over-the-cliff footage in TCOT Provocative Protege at 04:50 first appeared in Ep#85, TCOT Wary Wildcatter and can be seen in fuller form there at 02:14 - 02:17. This was a 20 year old car at best, and would not have been appropriate for a man of the victim's economic means. Submitted by catyron 12/10/17. Lt. Tragg's office door identifies him by his full name Arthur Tragg. Although this may not be the first time for the full name to be seen, the office door in early episodes and in the series credits identifies him only as Lt. Tragg. Submitted by Wiseguy70005, 5/13/14. NO CREDIT, NO CHECKS CASHED: The sign in the coffee shop at 26:00 on the DVD also appeared in episodes 80 and 85. Submitted by Kilo 6/4/2018. When Perry visits Donna just ahead of Tragg, she is playing a classical piece on the piano. Perry can�t �quite place it.� Later, Perry writes a note to Donna in jail and comments to Della that �I just remembered the title to a beautiful Beethoven overture.� The title in the note looks like �Fidelis� but it's �Fidelio� (compare the �o� to the �s� above) as is confirmed in the closing scene. Now, Fidelio is an opera and does have an overture, but isn�t this an odd piece for piano solo? So what was Donna playing? Submitted by Steve Fox, 10/20/04. + The music misidentified as Fidelio in the first scene, with Carpenter at the piano, is definitely the first movement of the Sonata Path�tique. In the scene Steve mentions, the closed captions claim Donna is playing an arrangement of Fidelio, but it sounds like no part of an orchestral recording I have reviewed. Lastly, as Perry Mason writes his note and Donna reads it, I cannot recognize the music playing as from the Fidelio overture, either. Submitted by gracep, 10/21/2010. + When Mason visits Donna in the cottage and remarks on her gifts, though he cannot name the piece, the music heard is a piano version of one of Beethoven�s Leonora Overtures. Since Beethoven was not especially comfortable writing for voices, he composed only one opera, Fidelio, and labored on it for some time. He wrote three different versions of the original overture which are now known as Leonora Overtures Numbers 1, 2 and 3 (Leonora was the heroine of the opera who disguises herself as a boy, Fidelio, to help her imprisoned husband). After all this effort, Beethoven eventually composed a completely different overture for opera performances. The Leonora Overture #3 is a well-known concert piece and is also sometimes played between acts of the opera; #2 is rarely played, #1 very rarely. The section Donna plays could be from either #2 or #3. Technically, therefore, Mason is incorrect identifying it as Fidelio. Submitted by FredK, 20 Nov 2010. Curious that when the big, hulking stranger walked uninvited into Donna's cottage, and sat right next to her, that she didn't scream or run away. Submitted by (lowercase, with a comma and period) masonite, 02/20/19. Several times, while Perry wrote the name "Fidelio", I closely watched the movements of his right hand (using one of those wonderful Parker 61 desk pens). I also looked closely at the name on the paper. I feel persuaded that the final letter, as Perry wrote it, is truly an "o" rather than an "s". Submitted by DocRushing on 15 September 2012. The correct way of spelling prot�g� is with an acute accent above each e. The title on the episode features none (although the DVD and DVD jacket does). Also the feminine form of the word (the prot�g� of the title is a female) is prot�g�e. Submitted by Wiseguy70005, 5/13/14. Wink, Wink: David Carpenter didn't die! Because he could no longer perform he became a conductor and changed his name to Borov (see "Bye Bye Birdie" (1963)). Submitted by Wiseguy70005, 5/13/14. About halfway through the episode, Perry is at a lunch counter (waited on by demurely dressed Alice) and reading a Los Angeles Chronicle article. Its headline is "Hearing Set in Carpenter Murder". Per the caption below Carpenter's photo, "Donna Ross, beautiful protege of the late David Carpenter, to have her preliminary hearing on the charge of murdering her famous teacher." Yes, Deputy D.A. Chamberlin, or whoever prosecuted at the preliminary hearing, surely still had to prove that it was murder. And the defendant's name is "Donna Lenore Ross", per Chamberlin, to distinguish her from all of the uncharged Donna Rosses, however beautiful and protected. Hopefully the Chronicle follows better standards of journalism nowadays. Submitted by (lowercase, with a comma and period) masonite, 02/20/19. + I think Collis just let himself in. When Worthington rang the doorbell it was Mrs. Carpenter herself who answered the door. Ie, no maid. Submitted by Kilo 6/4/2018. Hard to believe? It seems a bit hard to believe that on the stand Donna said that she was not aware David Carpenter was in love with her or at least has some interest after providing her a house, a car, and lavish gifts especially at 1960 prices. She is quite the naive one. Submitted by Perry Baby 9/29/15.